Wakkerstroom, the birding capital of South Africa, that is how it is marketing itself. A lovely little town on the border to Natal at 27.3545°S and 30.1436°E, 1774m abmsl. Half surrounded by the vlei on one side and the Ossewaakop on the other. It is the vlei that attracts many birds. 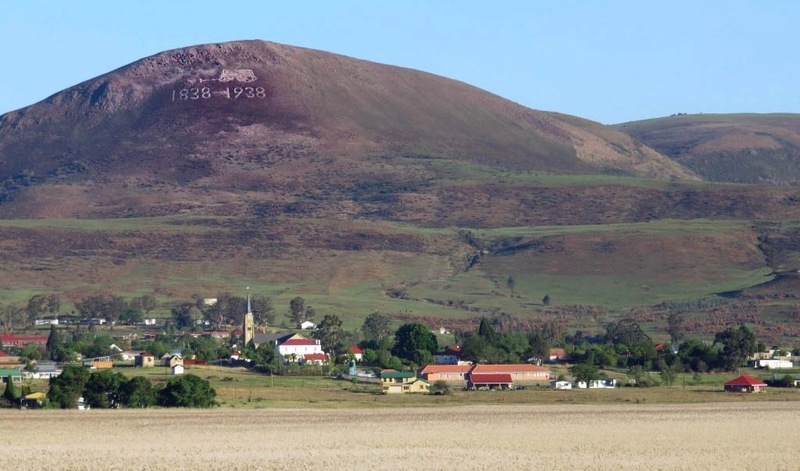 It is one of the oldest towns of the old Transvaal, and thus contains lots of history. The area around Wakkerstroom was occupied by a Zulu clan and I quote verbatim from ref 5: 'The town of Wakkerstroom which is called Othaka belonged to the abakwaShabalala clan under Chief Madlangampisi ka Mathe kaNdawonde. These people had been molested by the land hungry Boers since 1840 and eventually driven out or subjected to the servile labour under the Boers'. Initially, that is soon after the arival of the Voortrekkers the area was thought to be part of the Free State. Which claimed all the land to the south of the Vaal river all the way to its source near Ermelo. The Transvaalers had a slightly different idea and drew a eastern border along the Klip river. Well, we know who won the argument. Further, claims for ground has been opened to citizen of this republic, as far as the boundaries of this district. The time to register the claims will be announced later. Note the difference in spelling: Martins versus Marthinus, the last being the commonly accepted spelling. The executive council had instructed Dirk Uys (Swart Uys) to find a place in the area for a town to be laid out. This actually preceded the proclamation. He went to work very swiftly and because surveyors were in short supply he laid out the town using a belt cut from an Eland he had shot the previous day. His survey was so accurate that a surveyor who went out later had hardly any corrections to make. On the plan he submitted to the government he actually put the name of the town as Uys se Burg, but they didn't accept that since before that the name had been decided on already. His grave is in the cemetery, and note he lived to the ripe old age of 96, an absolute rarity in those days when people in general lived to their 50th and 60th. And why did the name not stick? Its most likely that Wakkerstroom rolls off the tongue much easier and what one also has to remember that MW Pretorius was not very popular as president, especially in the Lydenburg district. A start was made with a congregation in 1860 or 61. At that time the numbers were too small to afford a permanent preacher. The congregation was ministered to by D.van der Hoff and MC van Warmelo who travelled from Potchefstroom from time to time. I have to mention here that this congregation was not the NG (Nederduits Gereformierte kerk). but rather the NH (Nederduits Herformte kerk). But as early as 1866 there was a split in the church council with some members forming a new congregation called the Gereformierte Kerk, that was the embryo of the NG. This split came to an end, at least temporarily, with the unification agreement in 1885. 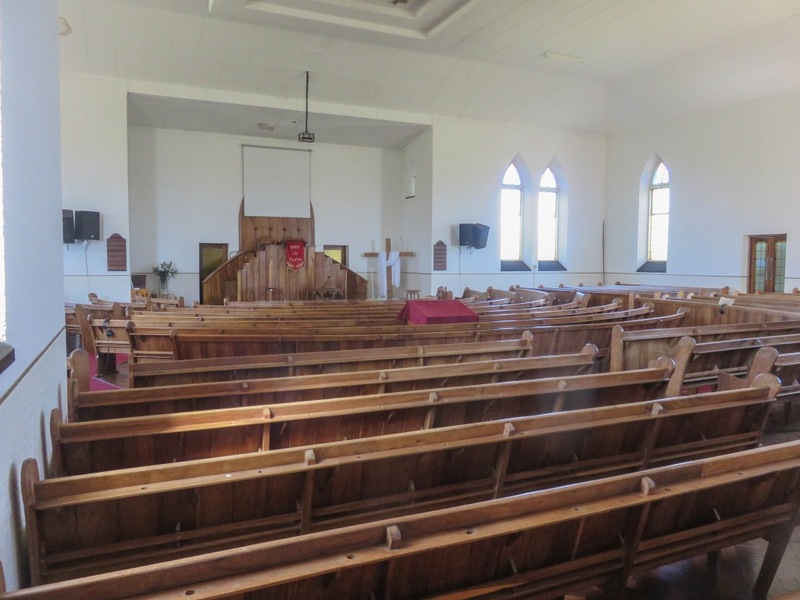 Soon after the formation of the NH congregation it was decided that a church should be built. The first church was very basic, 4 walls and a grass roof. 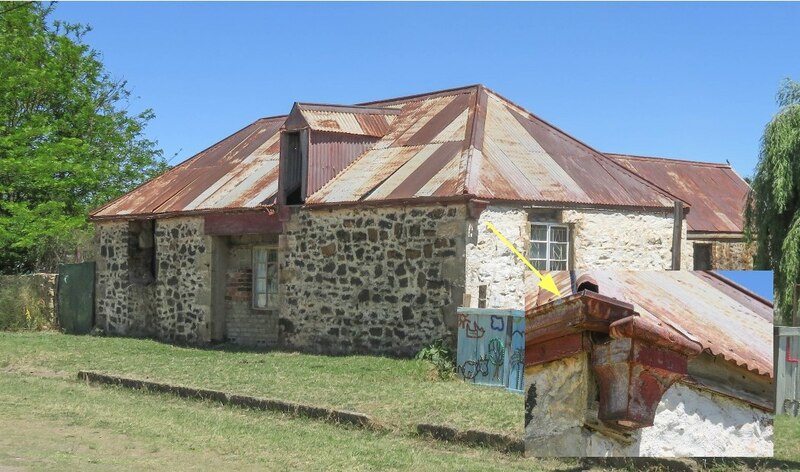 An improvement was made later in 1879 when the walls were raised by about 3 feet and a new roof of corrugated iron installed. 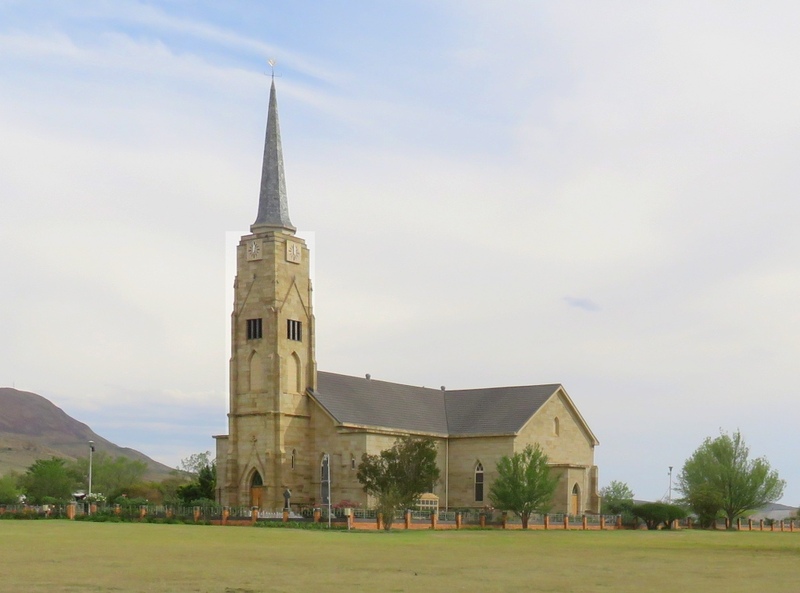 The British used the church during the 1st Boer War (1880/81), converting it into a fort. 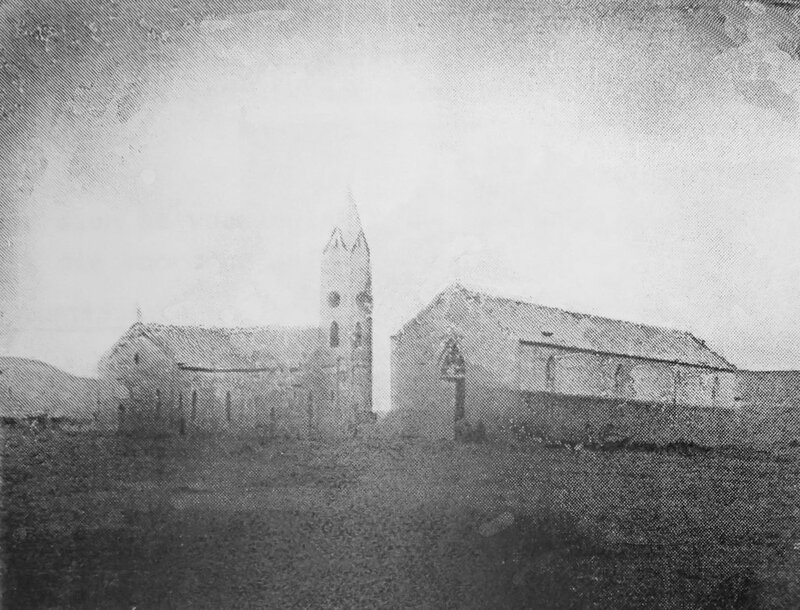 The picture shows what the church looked like in 1896, the picture comes from the church records. This church was finally dismantled in 1909 to make room for a youth hall. In 1874 the community felt strong enough to call for a full time minister, this was Ds DP Ackerman. He served the community from 1874 to his death in 1916 at the age of 68. To build a new church has been under discussion for a number of years and in fact a start was made in 1874 when a contract was issued. At the council meeting in July 1875 it was reported that the builder had disappeared. The project was left in abeyance for a while, but the subject was raised from time to time. Finally in 1887 it was decided to go ahead to erect a new church. The corner stone was laid 1888 and completion was 1891. Inauguration was on Christmas day 1891 and that was a major event. 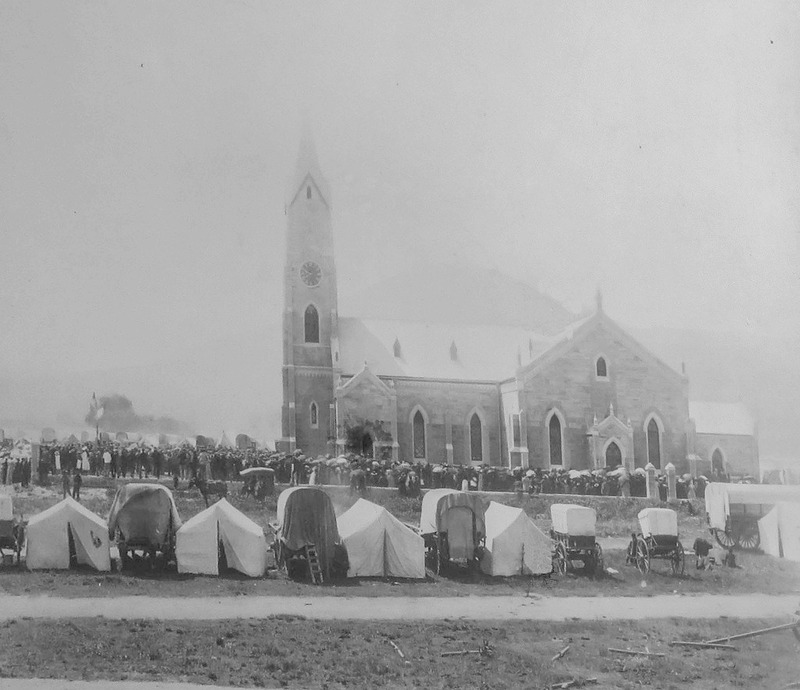 Starting Thursday the 24th it was reported that there were 850 vehicles of all descriptions parked around the church, of which 402 were ox-or horse drawn. I am not sure what the other vehicles could have been. Dignitaries present were ex-president MW Pretorius and Kommandant-General PJ Joubert. A service was held that afternoon in the old church to take leave of the old building. The morning of the 25th was the handing over of the key by the master builder Mr. Klute to Ds.Ackerman. This happened at the front door and is the occasion shown in the picture from the church records. The congregation then walked through the opened door into the church whilst singing psalm 100 verse 3. Festivities lasted for three days until Sunday. According to a document placed under the corner stone the cost of the building was £13400. The unification of the two churches was not a complete success. There were some members who objected. This came to a head when the NH church was re-established. The NH congregation demanded a 'share' of the property of the united church, known as the Nederduits Gereformierte of Herformte Kerk. Things did not get as acrimonious as in Heidelberg and was resolved by negotiation. The NH church was given a £1000 once off compensation and everyone was happy. In the grounds of the church we find various monuments. 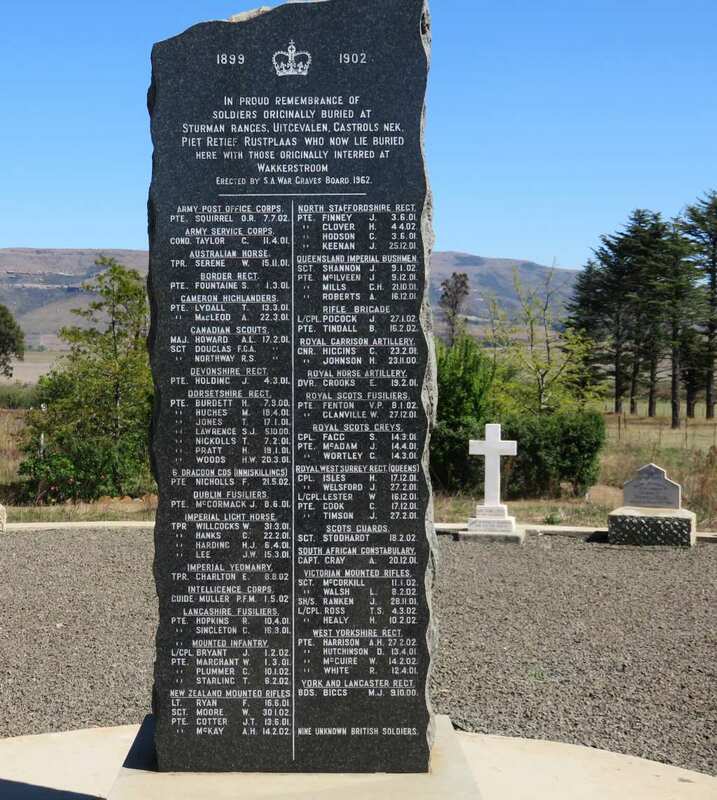 There is the memorial to the fallen members of the local commando of the Anglo Boer War. It unfortunately has been attacked by vandals who knocked the gun off the statue. It has been replaced with a replica. Near the church is the grave of Ds.Ackerman and his wife. The inscription, translated, reads: In fond memory of our respected teacher Daniel Petrus Ackerman, born 12-April-1848, died 2-August-1916, here appointed 8-January-1873, first preacher of the Ned.Herv of Geref. 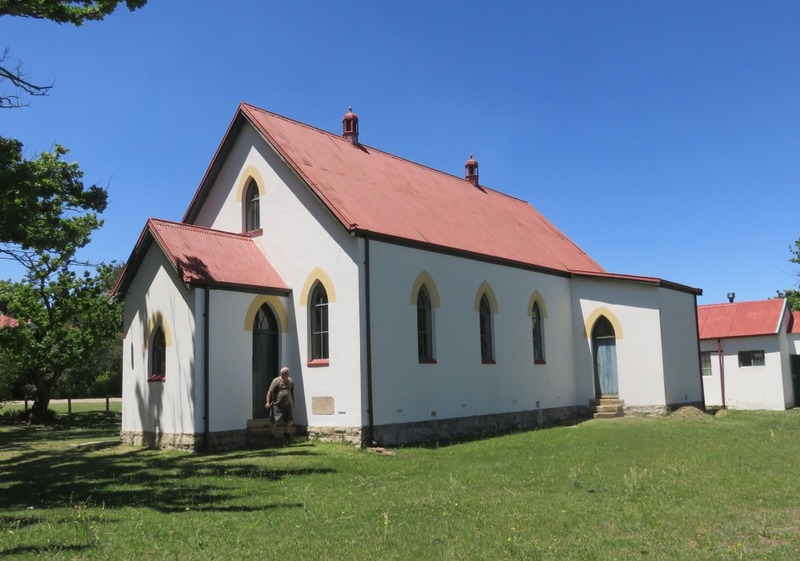 congregation Wakkerstroom. On the next face of the monument his wife: Hester Magdalena Ackerman, born as van Blerk, beloved wife of the late Ds.Ackerman, born 26-May-1850, died 20-July-1930. The St.Mark's church is Church of England commonly referred to as Anglican. It had an early beginning, services were known to be held by bishop TE Wilkinson and his clergy Rev M.Rouston and Rev JW Alington, as early as 1873. There must have been a sizeable English population in Wakkerstroom. Something one will notice when walking through the cemetery. 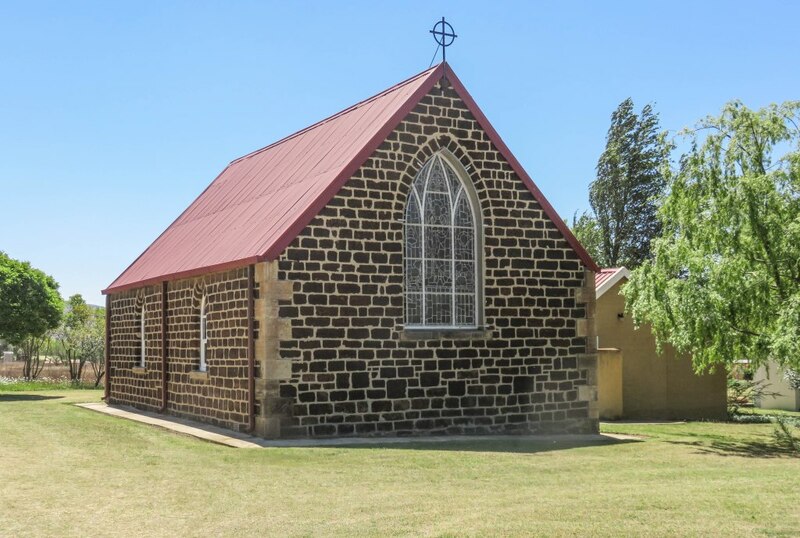 Wakkerstroom was transferred to be served by the bishop of Pretoria, HB Bonsfield in 1879. He went about to secure a piece of land for building a church and to appoint a resident priest, Rev.H.Sadler. A building committee was set up and the work of erecting a church could begin. After some ups and downs the building was completed and in April 1890 the bishop could consecrate the church. The building material is somewhat unusual, the rocks used is laterite, dressed to give it a squarish shape. There is still a pile of raw rocks lying in the grounds. In my wanderings, I have not seen this material used anywhere else. Laterite is an erosion product rich in iron oxide and aluminium hydroxide. I presume it comes from the vlei. 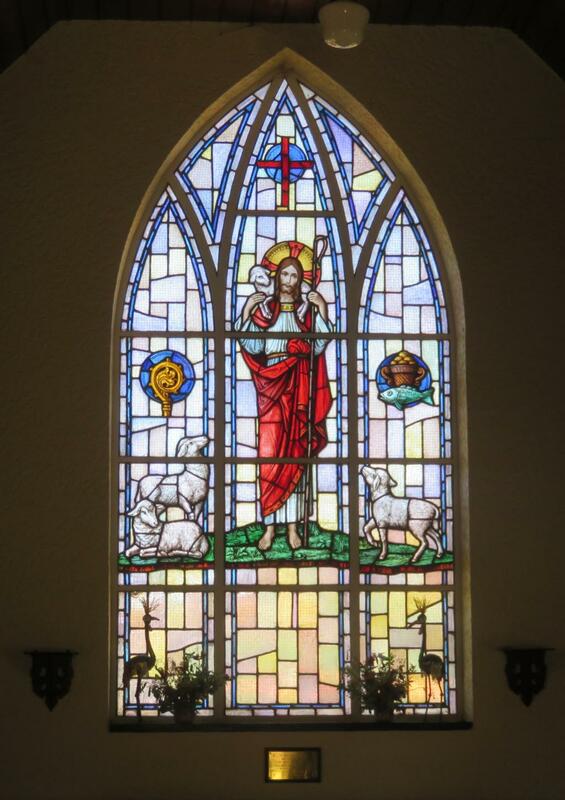 A beautiful stained glass window was installed in 1960. We noticed, on a Sunday, that the church is still in use. It is now the catholic church, originally when it was build in 1904 it was the Union Church. There is a picture in ref 3 that shows the foundation stone being laid, the caption refers to it as the 'Engelse Kerk', the English church. I have searched the internet and can't find out anything about a Union Church. Thus I have no idea of the background to this church. 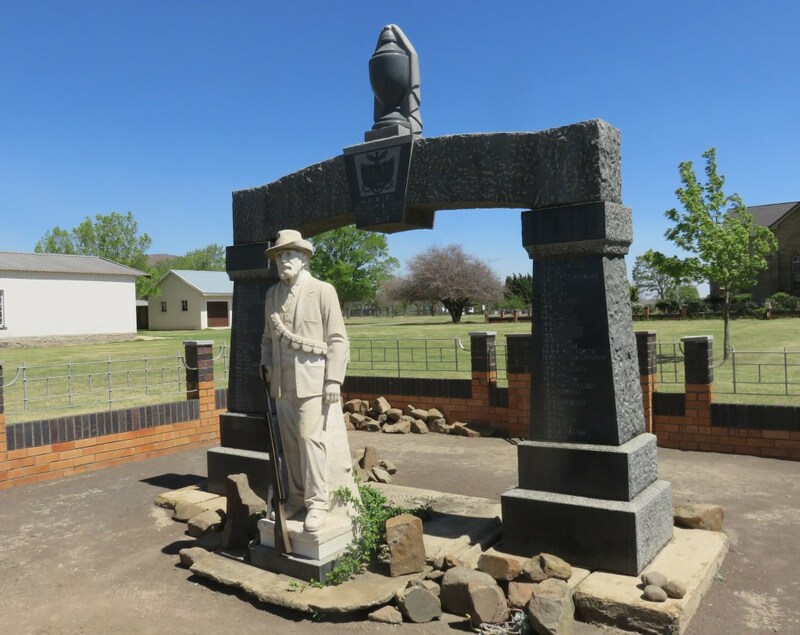 The inscription on the stone says: this stone was laid February 20th 1904 byDirk Cornelius Uys Esq in his 91th year Voortrekker & original surveyor of this town. Later it became the Apostolic Church, in 1941 the Hervormde Kerk and 1977 the Catholic Church. 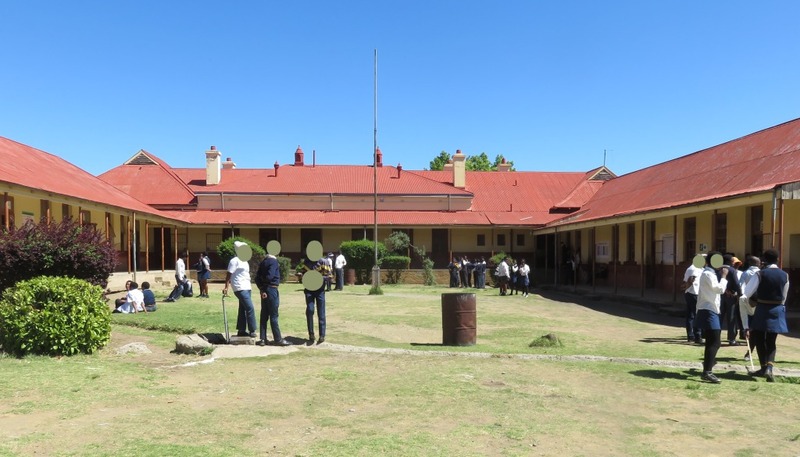 The first building of the school went up in 1898 and was known as the Marthinus Wessel School. This is what is now the front section of the school, facing the road. The cost was £1422 and 10 schillings. 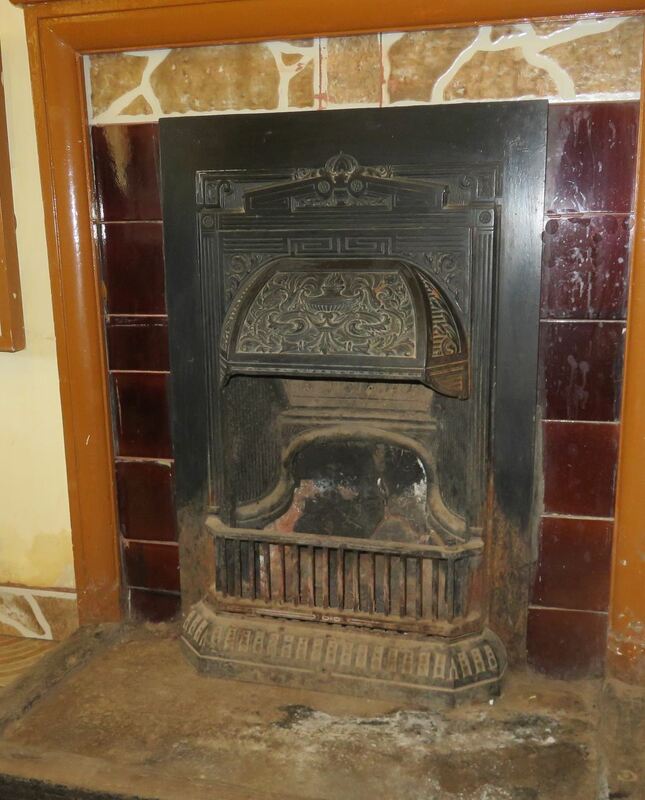 We found a lovely fireplace in this building. With time the school expanded with more classrooms added, the last expansion was in the 60th with new classrooms going up, one can clearly see the more modern style. 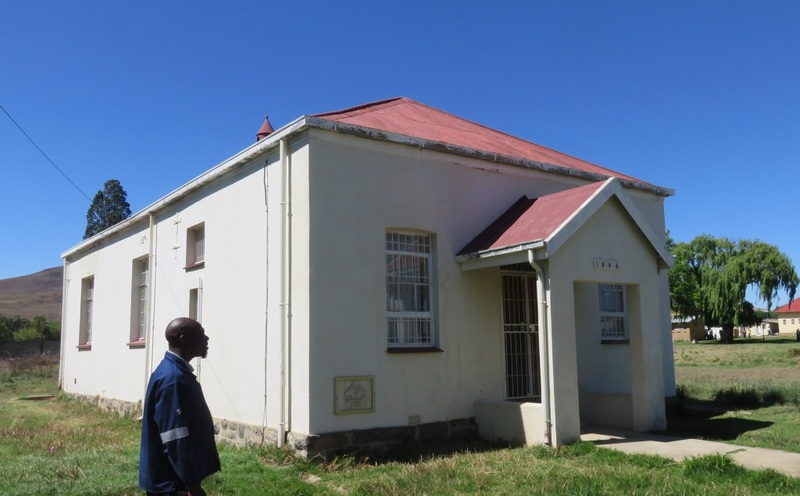 Also on the premises is the Free Mason Lodge, the first one in the old Transvaal, built in 1904. The building was donated to the school some time ago, it is being used as classrooms. Here is something I didn't want to print on this page, but felt compelled to do so in order to get it off my chest. Notice some pupils standing around in the picture. It was not break time, these are children who are not in class where they are supposed to be. Oliver thought that very strange and asked one of the passing teachers what was going on. No, he said they don't want to go to class. Strange, we thought and Oliver cornered another teacher and got the same answer in a bit more detail. Some of them just don't go to class and there is nothing the teachers can do about. We also noticed some pupils in class being taught. In town later we ask about the school and were told that things are going well now because the new fence at least keeps them on the school grounds. Before that, they were roaming around town making the life of the shopkeepers unpleasant. There you are, I must say this shocked me to the core and I could only think negative about the future of this country. I hope this is the only school where this is happening. Sorry again for printing this story, it should not really be in these pages. And if I have now caused some roughed feathers, so be it. In the cemetery there is a memorial and 18 crosses for the British soldiers who died during this conflict, 1880/81, not 79 to 81 as stated on the memorial. The town had some military stationed there some time before war actually started. At the time of the outbreak of hostilities (17 Dec 1880) the garrison had a strength of 120 men. There was a call for volunteers to strengthen the defence capability. Amazingly, to me at least, is that 45 men responded. An indication of the sympathies of the town folk with the British? This is very strange, since it was the burgers of Wakkerstroom that started the war, in a way. 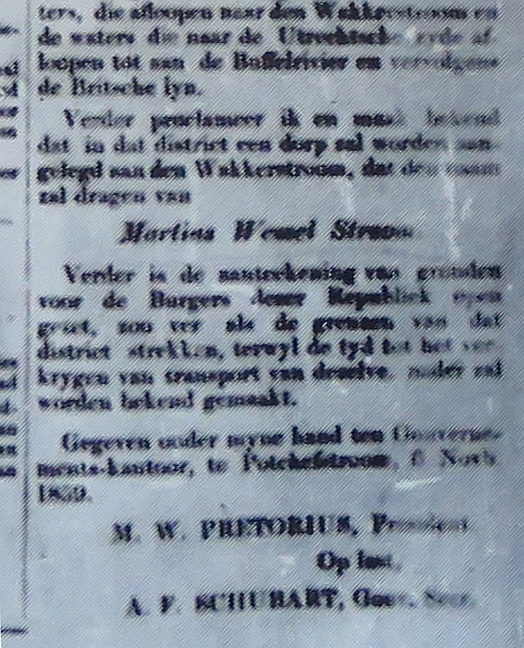 On 16 November 1880 an advertisement appeared in 'Die Volkstem' (a newspaper issued in Pretoria) signed by 113 inhabitants of the Wakkerstroom district. It was in essence a tax revolt, they were refusing to pay quit-rent and railway tax. One sentence in effect says it all:'And we hereby forbid all Englishmen or English partizans, or those who call themselves officials in this country, from coming on our ground or to our houses for whatever cause or reason, as we will have nothing to do with low betrayers of the country'. The full text of the advert can be found in ref 1. It cost the editor of the paper £25 and one month imprisonment, but on appeal he got off with nothing. The camp with fortification was just out of town, to the left of the road going down to Utrecht on the slope of the mountain. 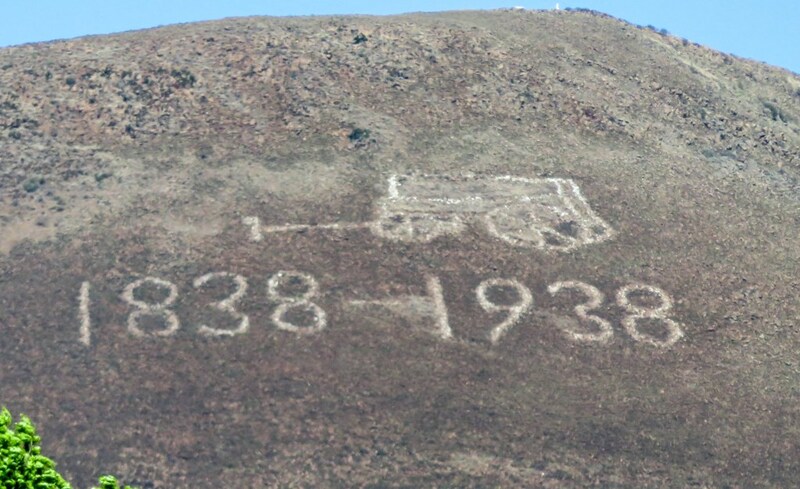 This is according to information from Chris Smit, the town's historian. Not much of the stone work is still visible. 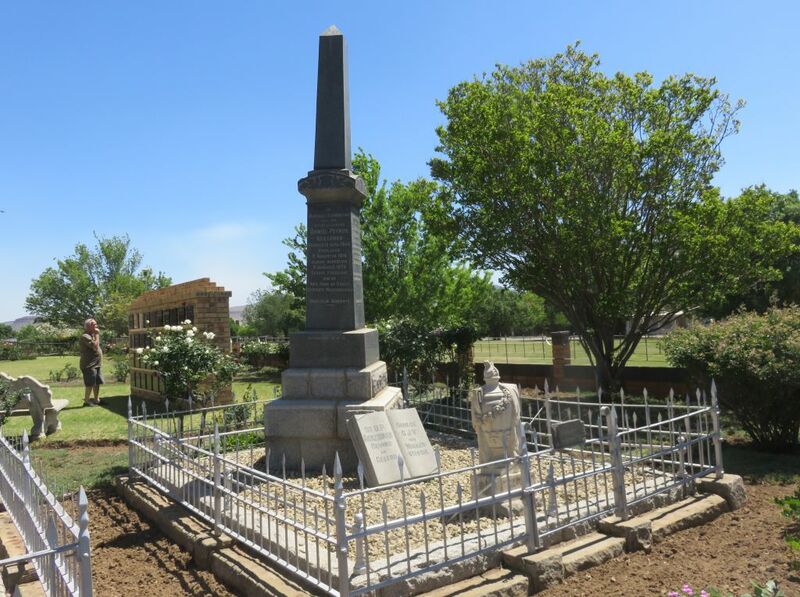 According to the Wakkerstroom website there were two casualties during the siege, William Bennet and Owen Byrne. So what about the other 16, is it possible they died of decease? 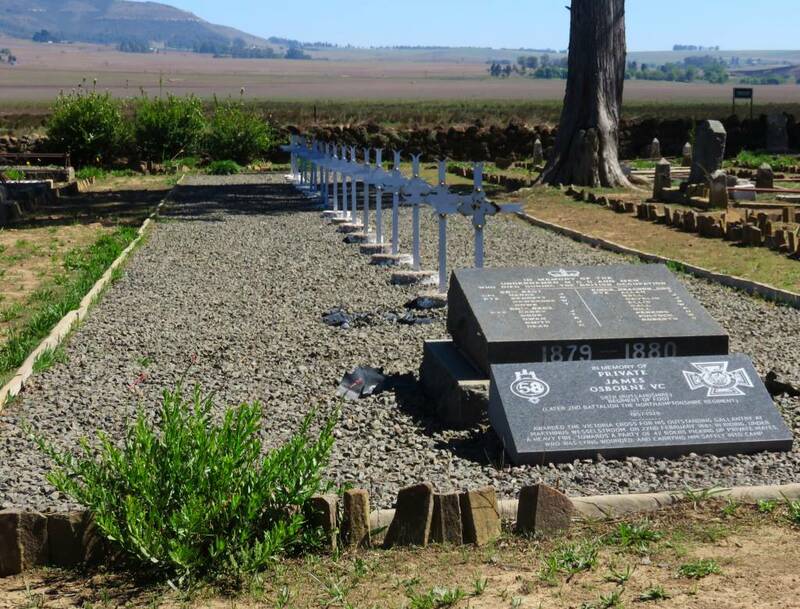 The British dead from the Anglo Boer war have been buried here, not only from Wakkerstroom, but also from the surrounding areas. 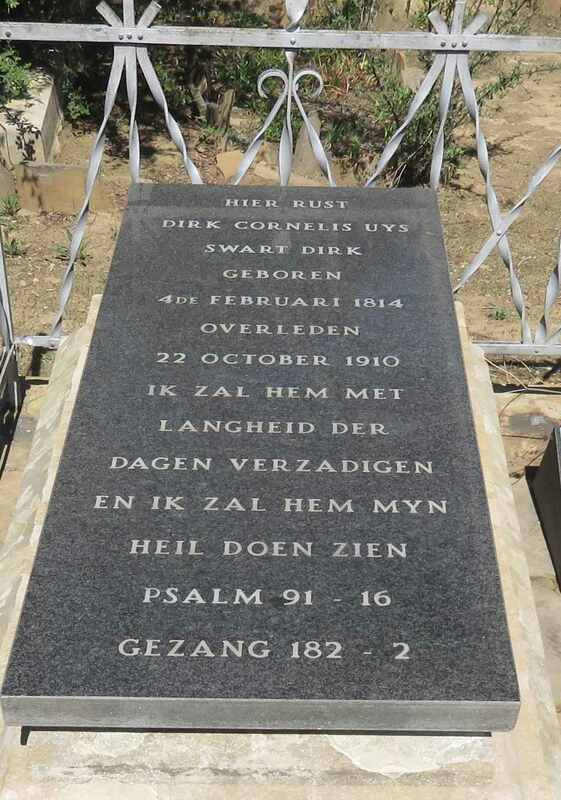 Places listed on the memorial are: Piet Retief, Stuurman ranges, Uitgefalen and Castrols Nek. The court house, which is now housing the magistrate, was built in 1897. It is one of the major buildings of that time period which does not have a foundation stone. That is because at the time there was tiff between komandantgeneral Joubert and president Kruger about who should lay the foundation stone. It remained unresolved and thus no inscription on stone. 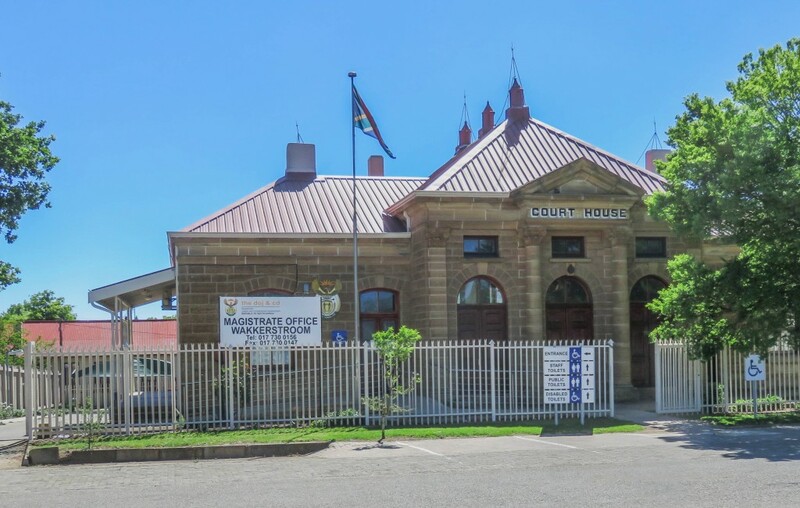 When 'doing' the court house we had a run-in with officialdom, because one is not allowed to take pictures without the magistrates permission. My argument that this is a public building, a national monument and maintained with my tax money did not count. So, don't look at the picture, it was taken illegally. The station is about 3 kilometers out of town on the far side of the vlei. It is on the branch line from Volksrust to Amersfoort, Morgenzon and Bethal, it was constructed in 1910. The rails are not in use, it became a victim of the general decline of rail transport. But the station is still there with its infrastructure. This was achieved by selling the buildings, thus conserving these structures. In this case the main building has been converted into a restaurant and the grounds serve as a camping area. Now,why is the station so far out of town. There is a history to it, which is in ref 2 and 3. 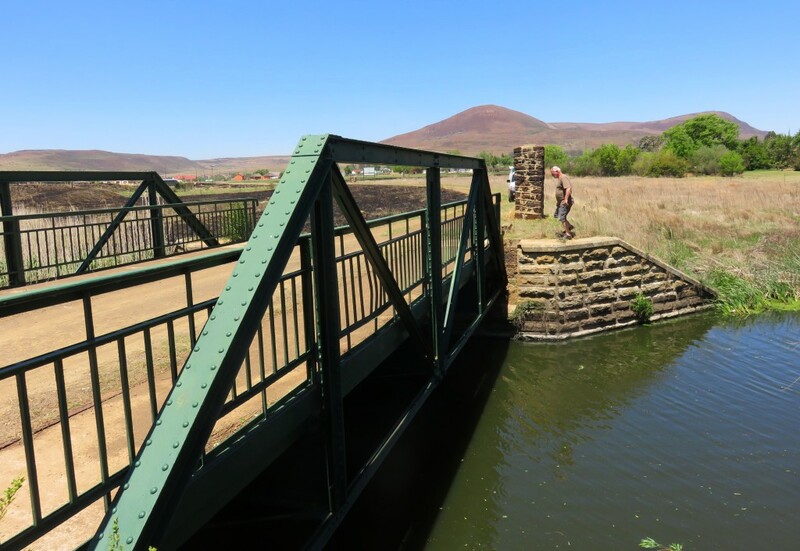 When the first railway line was constructed from Durban to Johannesburg in 1895, the people of Wakkerstroom sent a petition saying that they don't want the line to come through Wakkerstroom. Reasons given was that "it would dirty their daughters, cause the chickens to stop laying and the cattle to have deformed offsprings". The railway conceded and took the line through Volksrust instead. Later the town's fathers regretted the decision and re-approached the railways, the somewhat laconic reply was that as the tunnels had already been built it would actually be cheaper to relocate Wakkerstroom than change the line. When the branch line running from Volksrust through Amersfoort to Bethal was conceived, again the burghers signed a petition that they don't want a station in town. 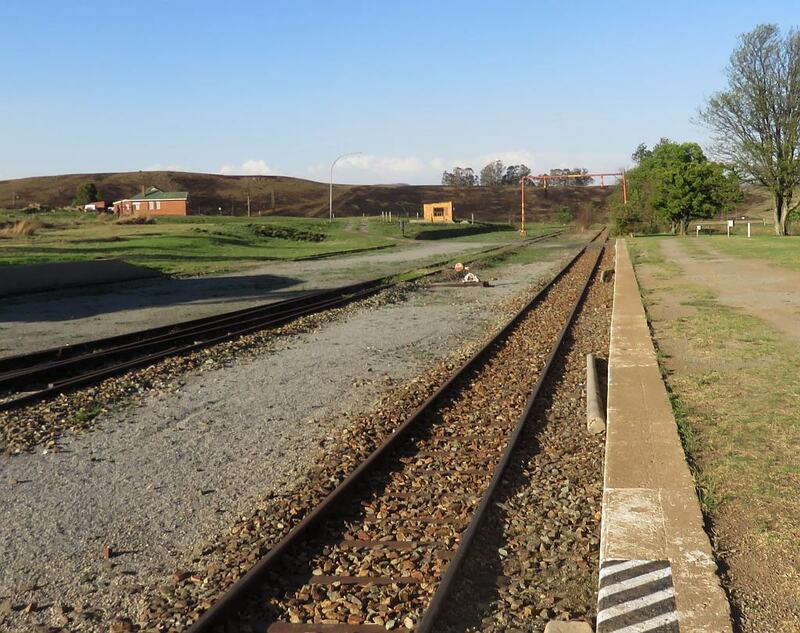 The railway, most likely, with minimum hesitation, decided to reroute the line so that it would not have to cross the vlei twice. Taking it around the vlei, not having to put up two bridges and long embankments, was much cheaper. There you are, that is why it is 3km out of town. here in the Marthinus Wessel stream by D.Bryant. In the literature I also found a note that it is also the result of Paul Kruger on one of his annual visits got stuck in the drift, some say deliberately. Driving through the back roads of Wakkerstroom we noticed a very strange structure. Was this going to be a house? It had no straight walls, no roof structure, no acute angles. Difficult to describe, check the pictures. 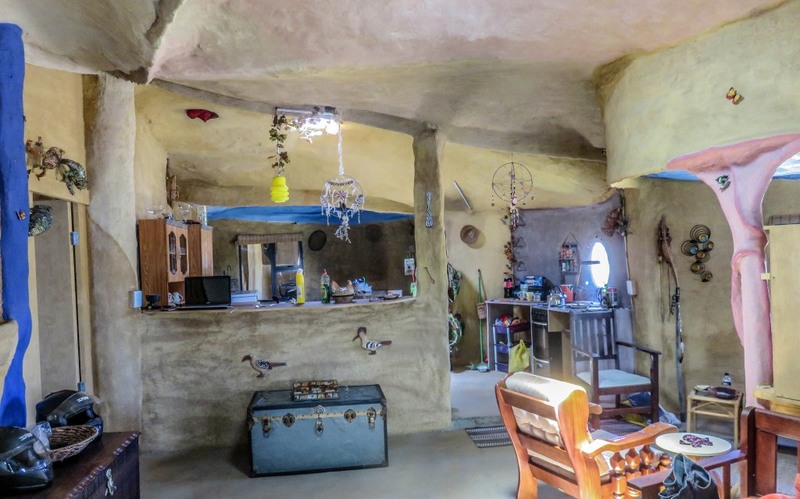 The chief architect and building contractor is Wessels van Dyk, supported by his wife Mariliese. 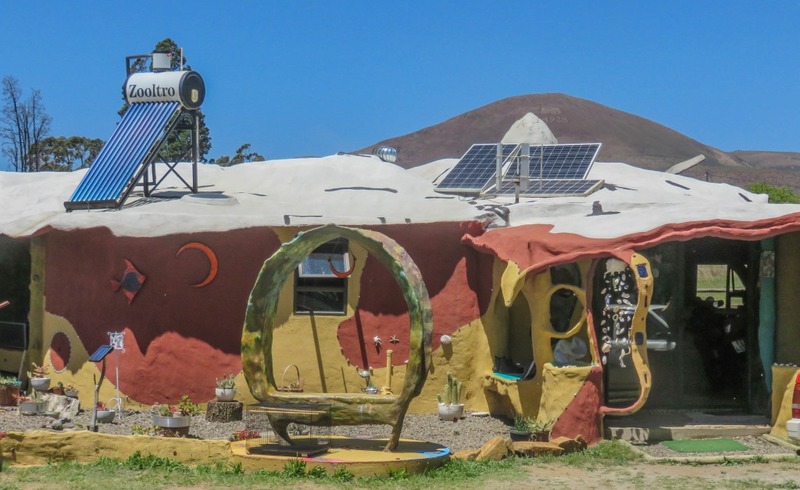 It is not the usual brick and mortar construction. 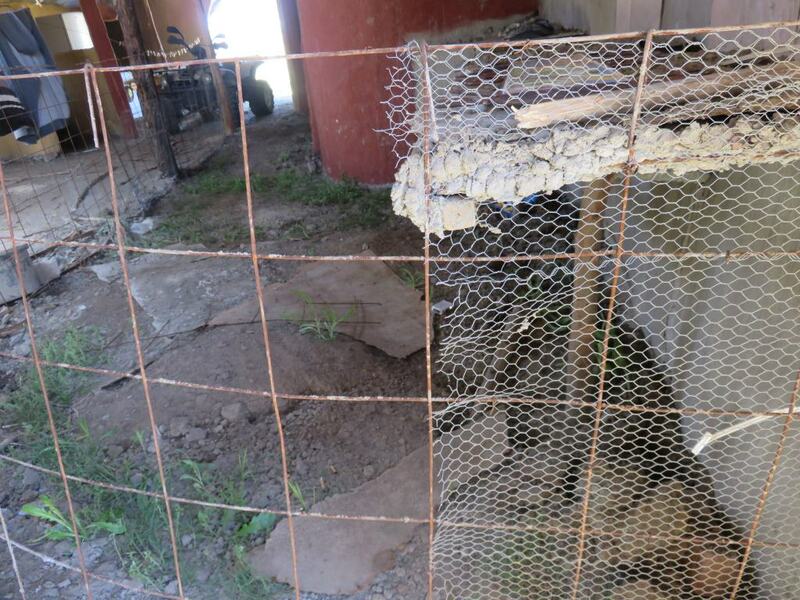 The basic element is a sheet of reinforcing wire covered with chicken-wire pulled tied and well attached to the reinforcing. The mortar is then applied to both sides until a thickness of app. 40mm is achieved. Only the highest grade of cement (42.5N) should be used. It works. The only problem I see is conduction of heat, the place must be very cold in winter and hot in summer. At another part of town we noticed an other building going up in a very similar style. The method there was very similar with a difference, there they have a 20mm layer of some insulation material in between. That would make a big difference to the conduction of heat. One finds this in Uys street. According to the guide these are buildings still standing from the 1860th. It looks like the building served as a horse stable in its days. The hatch in the roof served for storage of the horse fodder. I like the design of the gutter, see details in the picture. 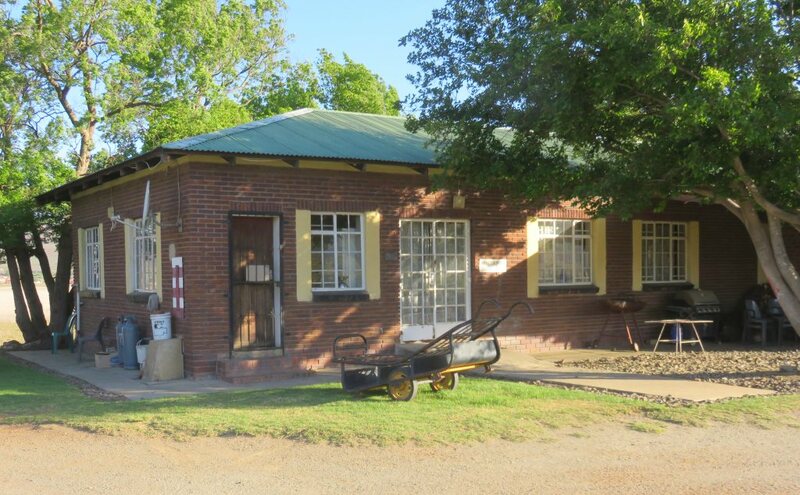 Another old building is the officers mess used during the occupation by the British in the Anglo Boer War. 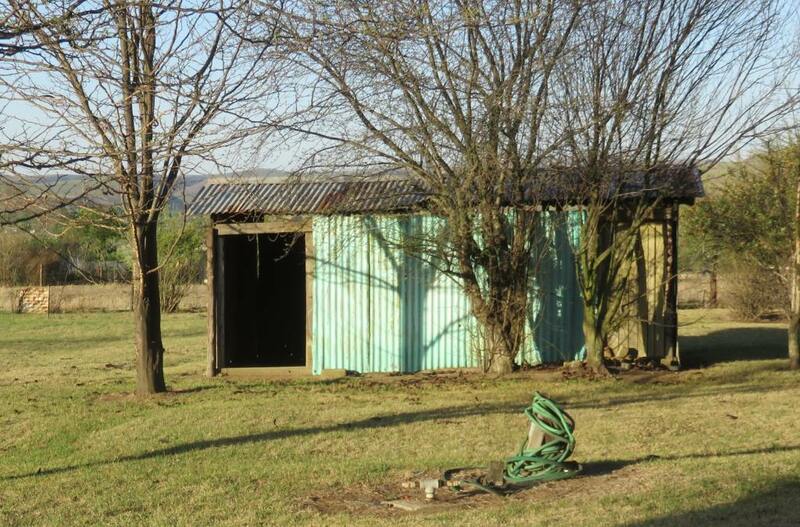 A very spartan building, a couple of poles and corrugated iron sheeting. This the prominent mountain to the south of Wakkerstroom. It's highest point is 2069 meter, that is the point where the mast is. The points of interest up there are three British forts, erected during the Anglo Boer war, each high point has got one. They are, of course, just a heap of rubble now. But still interesting to look around, to try and figure out what was what, and to pick up pieces of this and that. An other feature is the marking just below the view point commemorating the centenary of the trek. I would normally not pay too much attention to this, but what is interesting is the way it was laid out. It was a school project at a time before cell phones. To get the layout right required an observer in town and a team of boys to place the white stones. To communicate the person at the bottom used a mirror and the sun. It meant some code had to be developed to give direction. Ref 8.: verbal information received from Chris Smit, the unofficial town historian.